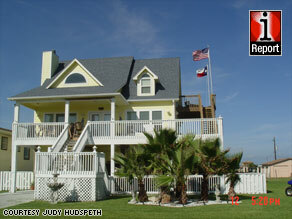 Warren and Pam Adams lost a house to Hurricane Rita in 2005, so it seems they'd be relieved to learn their new home withstood Hurricane Ike. 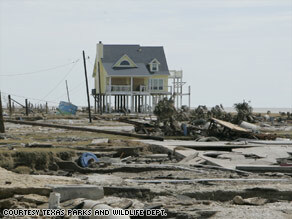 But not when their house is the only one still standing in their section of Gilchrist, Texas. I was just visa processed here in Cairo with a guy who said he lived in Katy, Texas. We lived on the border of Katy & Houston for a year. He said "you wanna see my beach house?" I thought he was joking (Katy is no where near a beach). He pulled out a photo of the beach area in Crystal City, Texas, with a circle & arrow pointing to a totaled building, saying, "our beach house." It was shocking! Only one house in his area survived. They had the house for over twenty years. Mos of his friends there lost their houses too. I'm not even an expert, and I can tell that this has been Photo-shopped. And a piss-poor job was done of it, too. Are you sure? I picked this from the CNN article, so I would presume they have better means to scrutunize than me. What would make you suspect these are photoshopped? This particular house I've read about. 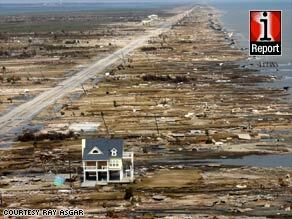 3 years ago Hurricane Rita destroyed the owner's previous house, which was built in an old style. They had it rebuilt in the new hurricane resistant style. The neighbors had not suffered the same issues with Rita; hence, when the stronger Ike went through, it took out all of the houses that had survived Rita, but the more recent and stronger house survived. stop building directly in high tide. it's annoying that insurance pays out to people that are unable to build in logical places.